One thing is beyond question: Photograph 51 – which was taken by Dr. Rosalind Franklin, the visionary X-ray crystallographer and chemist – was crucial to the momentous scientific paper explaining the molecular structure of DNA. And without that photograph, the “double helix” model that shook the world in 1953, and earned James Watson, Francis Crick and Maurice Wilkins the 1962 Nobel Prize in Physiology or Medicine, would have been considerably delayed at best, and perhaps even explained first, by another team of scientists. So why was Franklin not named one of the three Nobel recipients? Or at the very least, why was she not loudly and clearly acknowledged by the three men who did receive the prize for supplying absolutely vital insight into the understanding of the material that carries the genetic information in nearly every living organism? 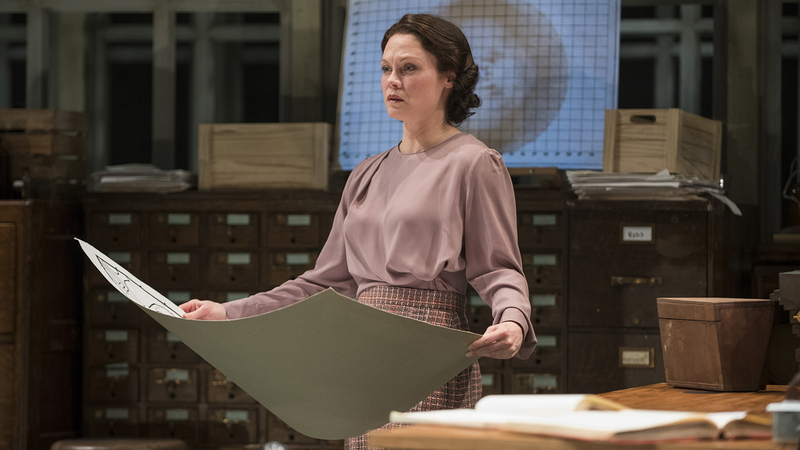 These are the questions at the core of Anna Ziegler’s semi-fictionalized play, “Photograph 51,” now receiving a biting, emotionally vivid production at Court Theatre – a company whose connection to the University of Chicago (a renowned hotbed of scientific activity and Nobel laureates) only adds a frisson of interest to the story. A British-born scientist from a prominent Jewish family, Franklin (beautifully portrayed by the invariably compelling and bristlingly smart Chaon Cross, in a role Nicole Kidman played several years ago on the London stage), was 31 when, in 1951, she returned to England after several years of postdoctorate work in Paris. She was to be Wilkins’ research associate at King’s College London, but the two got off to a rocky start, and things only deteriorated as time went on. Fiercely independent and intense, confident in her special ability to detect patterns, and unapologetic about her preference for working alone rather than as part of a group (a group that was, by default, an exclusive boys club), Franklin demanded to be treated as an equal rather than an “assistant.” And she bristled at what she perceived to be the sexist, condescending attitude of the stiff and painfully socially awkward Wilkins (an impeccable turn by Nathan Hosner) who persisted in addressing her as “Miss Franklin” rather than “Dr. Franklin.” Wilkins, lonely and awkward with women, was upended by her – at once undone by her bluntness, and, at the same time, attracted to her. Trouble. But the truly bedeviling interlude in Franklin’s career came by way of the two scientists who were working on the same subject at Cambridge – one of whom was hell-bent on beating yet another competitor, Linus Pauling, to the punch. And here comes the most troubling part of the story: At a crucial moment, Watson was shown Photograph 51 without Franklin’s knowledge or approval. And he and Crick immediately used it, along with other sources, to develop the chemical model of the DNA molecule. Was Franklin simply so obsessed with being certain about the correctness of her work that she was oblivious to the competitive fever and race to the finish line of the men? Or, in a blatant disregard for professional ethics, was she brazenly betrayed by them out of resentment for her combination of brilliance and emotional distance? And why did the Nobel committee fail to address the omission? Was it that Franklin died of ovarian cancer in 1958 at the age of just 37 (and possibly as a result of exposure to X-ray radiation), combined with the preference (subsequently a formal guideline) not to give the award posthumously, or to more than three people? Ziegler has crammed a great deal into her 90-minute play, and manages to make the emotional dynamics crystal clear and the science accessible. Director Vanessa Stalling and her cast are with her every step of the way, with Arnel Sancianco’s handsome double-helix-like winding stairways on either side of the stage cleverly echoing the all-important DNA model. And there is this bitter irony: Since her death, Franklin’s star has only grown increasingly bright, with countless awards and honors in her name, feminist tributes that she might very well have found irritating, and a growing awareness that women have for far too long been under-represented in science. Acclaim delayed is acclaim denied, although Franklin had a potent sense of her self-worth even as she admitted to self-doubt when faced with mortality. Ziegler’s references to Shakespeare’s “The Winter’s Tale” – in which King Leontes’s beloved but terribly abused wife, Hermoine, magically returns from the dead – might just express it best. She suggests Franklin’s interpretation of the scene (whether real or imagined by the playwright) is far more realistic, and that what some see as a happy ending is nothing more than wishful thinking – a figment of the King’s guilt-ridden imagination. “Photograph 51” runs through Feb. 17 at Court Theatre, 5535 S. Ellis Ave. For tickets ($50-$74) call (773) 753-4472 or visit CourtTheater.org. Running time is 90 minutes with no intermission.